Kerry, my wife, brought to our attention a great story by our friend and mentor, Bruce Larson, in his book Believe and Belong (Revel, 1982:21). Bruce contrasts two ways of carrying the weight of the world. Statues of both are found in the heart of New York City—a city filled with people trying be bear the world’s weight on Wall Street, at the United Nations and in international NGOs. In front of the GE Building a statue of the Greek god Atlas portrays one approach. A muscular Atlas strains to carry the cosmos on his shoulders. According to Greek mythology, this task was for him a curse rather than an act of courage. The other statue is found in St. Patrick’s Cathedral across the street from the GE building. 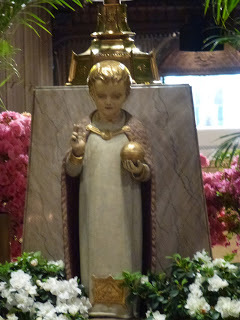 It portrays Jesus as a humble young boy effortlessly holding the world in his hands. His hands seemed designed to carry it. I want to be clear on this issue: there is no evil that so wounds our soul as pride.” (Gregory of Nyssa, Sermons on the Beatitudes, paraphrase by Michael Glerup (IVP Books, 2012: 27-28). The Spirit continually invites us to fast from the death-dealing pride that so deeply wounds our souls–and tragically wounds other people. For example, when I finished writing this I caught myself wondering if anyone might be impressed that I was reading Gregory of Nyssa. That sounds so scholarly. Then as I wrote this confession, I wondered if people might be impressed with my humility in admitting it. Pride runs deep, fast and is so slippery. Jesus, in voluntary humility, endured both our hostility against God and the hostility we have against our very selves. Lent is a time to empty our hands and only carry on our shoulders the light and easy weight God places there. The Spirit invites us to shift our focus off ourselves, and look to Jesus who has not only the weight of the world, but even our hostility against ourselves in his pierced hands. Hi Tim. I am the pastor of a church in SC. I have read this story before and wanted to use it, but could not verify the existence of the statue of Christ at St. Patrick’s. Can you verify that the statue you picture here is indeed in St. Patrick’s Cathedral in NY? I can’t find it anywhere else! Thank you my brother!